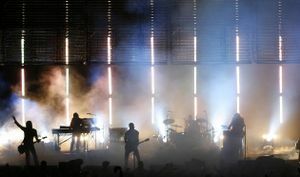 In the Summer of 2006, Nine Inch Nails embarked upon its Summer Amphitheatre Tour (also called the Inconvenient Truth Tour), featuring supporting artists Saul Williams, Bauhaus, TV On the Radio, and Peaches. The tour is part of the Live: With Teeth tour. Each performance (except 5/26 in George, WA) had a unique poster for sale. The so-called ‘waffle iron’ or ‘cheese grater’. The lighting for the summer tour was a change from the winter and spring "teeth" panels. A grid of Versa RAY pixel lights arranged in a cage hung over the stage, occasionally moving down and up to display visuals, through which the band may be seen. Seven large, vertical, immobile rectangular panels were in the background akin to the three mobile ones from Fragility 2.0. "Somewhat Damaged:"With the house lights still on, Reznor would suddenly appear near the cage and begin the first verse right away. This caught fans unsuspected as the band had usually begun shows with a pre-recorded track such as "Pinion" to build up the hype. Trent Reznor in front of the light panels during "Closer." "Closer" with "The Only Time" breakdown: Reznor stood in front of the center panel whilst it glowed red, reminiscent of Fragility 2.0. 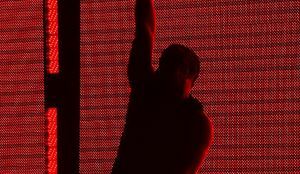 This produced an illusionary silhouette effect, especially for the audience members far away from the stage; it looked like the lights were moving instead of the completely contrasted dark figure that was Trent. "Help Me I Am In Hell:" Cage was down for "lava lamp"-esque visuals. "Non-Entity:" The previous song hyped the crowd up for "Happiness In Slavery," but instead of havoc-wreaking machinery they heard this instead. The upside is the eerie "fading away" tentacle effect on the cage during the chorus. "Only:" Pixel-y static visuals zooming in and out due to the contrast twixt cage and panels. "La Mer:" Reznor begins by improvising on the keyboard a bit, and then lead into the beginning of "La Mer." North joins in, and right when the build up is supposed to occur, the band directly cuts to "Into The Void," a song with the same theme. The panels glow pink for "Into the Void." "The Big Come Down:" Arguably the live perfrmance of this song is far more aggressive and energetic than the album version. "Head Like A Hole" energetic song always used to end the show. As the song faded out, the cage was lowered, this time with the NIN logo appearing on it. The following is a setlist breakdown for this leg of touring, a,b or c indicate that these songs are played instead of each other, or occasionally together. This page was last modified on 8 December 2018, at 23:09. This page has been accessed 54,203 times.